The death of Jesus cannot be separated from His Resurrection. It is in the light of the Resurrection that the Crucifixion becomes a sign of victory. As we move towards Holy Week I would like to present images and commentaries in which cruelty and tragedy become God’s victory over evil. It is only in the light of the Resurrection that early Christians and present Christians are able to see this. Richard Harries in his Ashgate Studies in Theology, Imagination and the Arts, entitled The Passion in Art, does a thorough presentation of this unity along with other artists and commentators I will be presenting. Within the catacombs are paintings and inscriptions which gives us an insight on how the early Christians say their faith, especially on how they approached death. Many of these scenes are taken from the Hebrew Scriptures, but nearly all of them, including the New Testament express the hope of deliverance or salvation. The Gallery below presents some images of deliverance. In the catacomb of Domatilla there is the epitaph below to Antonia. The anchor was already a symbol of hope in the Roman world but it took on a deeper meaning with the Christians. In the Letter to the Hebrews 6:9 we read: “we have this as a sure and steadfast anchor of the soul.” This is no ordinary anchor however, for the crossbar has been transformed into a cross, and attached at either side to the hooks of the anchor, are two fishes. 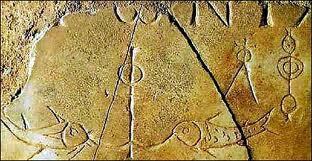 The fish was an important symbol in the early Church, first of all for Christ Himself. Another example of the salvific Cross in the Vatican’s Pio Christiano Museum. 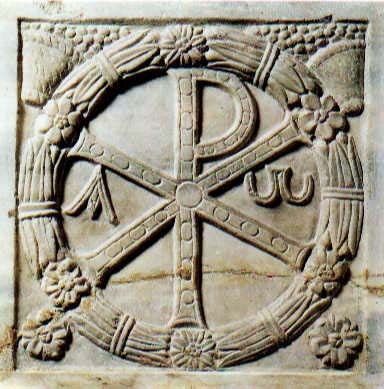 Here the Cross has a “P” symbolizing “Pax” or Peace with the Alpha and Omega and the Chi-Rho. To be noted is the wreath surrounding the Monogram which is the wreath of victory about which are the baskets of grapes with introduces a Eucaristic theme. 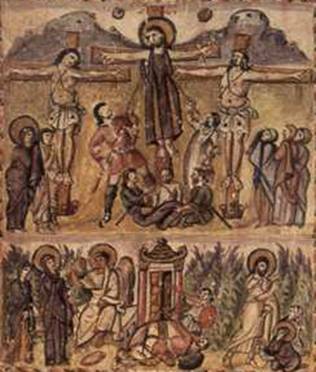 Images of Jesus’ crucifixion were not depicted in Christian art until the fourth or fifth century, and in fact, it is believed the early Church avoided this image. 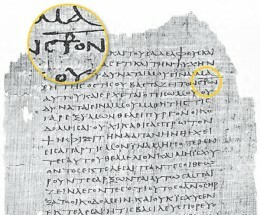 An article in Biblical Archeology Review by Larry Hurtado(March/April 2013) highlights an early crucifixion symbol which sets the date back by 150-200 years. A summary of Mr. Hurtado’s article is found in Bible History Daily. 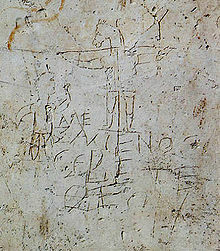 This graffiti, carved into plaster, was discovered in 1857 during archeological excavations and was soon dubbed Alexamenos graffito. It is old and faded and the original design is difficult to discern, yet a careful tracing reveals two roughly-drawn figures and a string of Greek characters. To the left is a man raising his hand in adoration, in worship or prayer. To his side, rising above him, is a second man suspended from a cross. Crucifixions were commonplace in ancient Rome and this man looks like we would expect: his arms are outstretched, pinned to a crossbar, his feet are planted upon a platform, he is wearing some kind of a garment that covers his lower body. What distinguishes him from any other crucified criminal is that while he has the body of a man, he has the head of a donkey. The inscription says, “Alexamenos sebetai theon,” “Alexamenos worships his God. 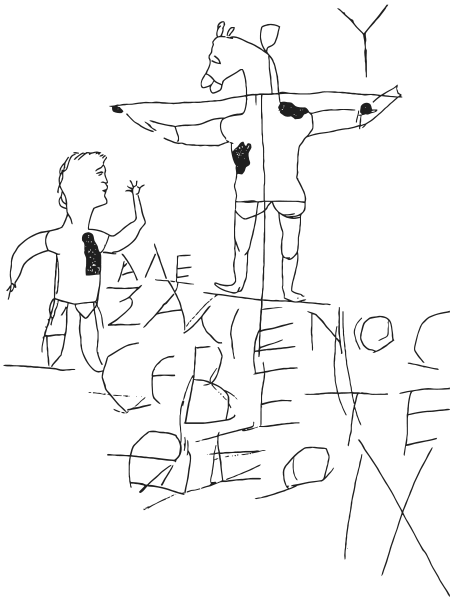 Historians date Alexamenos’ graffiti to approximately 200 A.D., making it the earliest surviving depiction of Jesus upon the cross. Yet this is not a religious icon meant to elicit awe or worship. This graffiti is a mockery of Alexamenos, an ancient Christian, and a mockery of a God who would die the shameful death of a criminal. At the time the graffiti was created there was freedom from systemic persecution, but, Christians were mocked and belittled. They faced the shame of worshipping a God so many others denied. They faced the shame of worshipping a God who had been put to death as a common criminal. Alexamenos, a Christian, endured such persecution, a man who proclaimed that Jesus is Lord. He worshipped a God who became man and who endured the most painful and shameful death devised by the minds of that day. And as with so many Christians before and after him, he was mocked for what he believed. 150 years before Alexamenos, the Apostle Paul had written “For the word of the cross is folly to those who are perishing, but to us who are being saved it is the power of God” (1 Corinthians 1:18). This plaque is one of four, which though now separated, must originally have been mounted on the four sides of a small square casket. Each is carved with scenes from Christ’s Passion. The other panels depict Christ carrying the Cross, the empty Sepulchre and Doubting Thomas. This is the earliest known narrative portrayal of the Crucifixion. It is combined with another scene of death, the hanging of Judas. The stiff, clothed body of Judas pulls down the branch of a tree and a spilled sack of coins lies at his feet. In contrast the exposed limbs of Christ appear still vigorous, and He gazes at the viewer, triumphant in death. A plaque over Christ’s head is inscribed REX IUD[AEORUM] (‘King of the Jews’). Mary and John stand in similar poses to the left of the cross, while on the right Longinus steps from beneath the arm of the cross across the frame into the viewer’s space. In the branch of the tree which bends towards Christ, a bird feeds her chicks – a symbol of the life-giving power of His death. The depth of the carving – almost three-dimensional – and sense of movement in this particular plaque are typical of the continuation of the classical tradition of ivory carving in Rome. 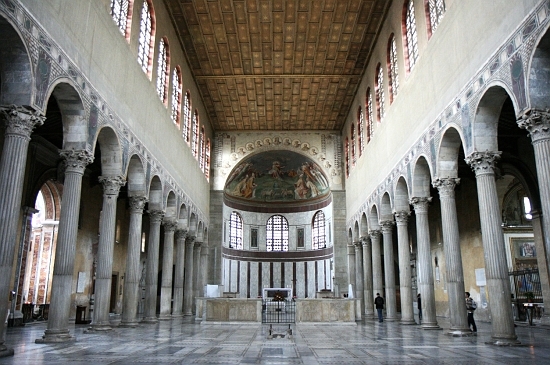 Santa Sabina was built at the top of the Aventine Hill on the site of the Temple of Juno Regina, using many of its materials. The church was an expansion of a Roman house-church (titulus) owned by a woman named Sabina. As was common in ancient Rome, the church preserved the name of the title holder by simply adding “Saint” onto her name. The Church of Santa Sabina was founded around 425 AD by the presbyter Peter of Illyria, who recorded his name and good works in a mosaic inscription (which can still be seen). It was completed by about 432. Of special interest for the believer are the doors at Santa Sabina for it is here in an upper panel historians believe we have a complete Crucifixion of Jesus. 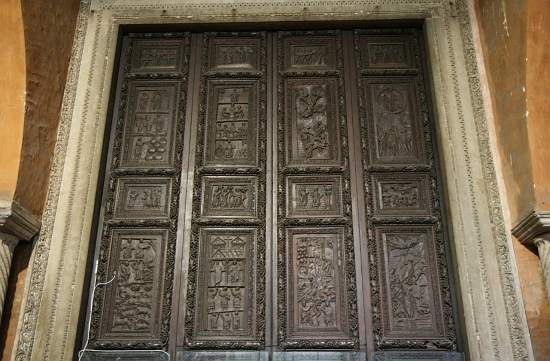 Beautifully carved from dark cypress wood, the ancient door contains 18 panels of narrative carvings, most depicting biblical scenes. Its frame is made of 3rd-century marble spoils. 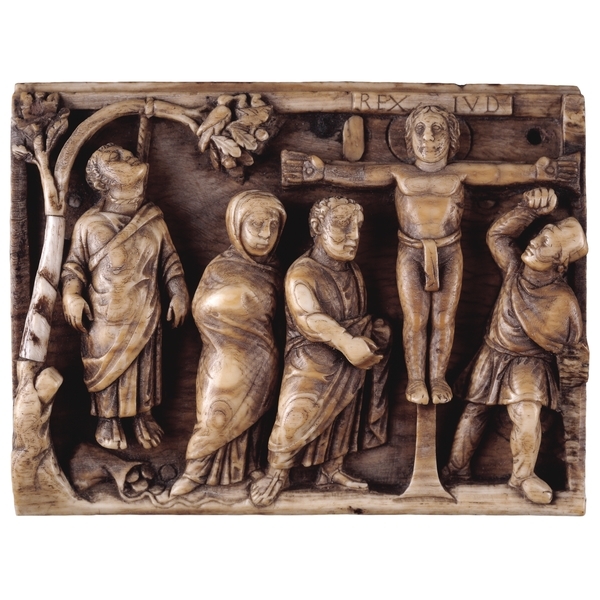 Of particular interest to the believer is a 5c carving believed to be one of the earliest artistic representations of the Crucifixion. Jesus is shown more or less the way we are used to seeing him today, as an athletic young man, bearded and without a halo. At first sight, the crucifixion is also represented in a manner familiar to us. The condemned men are shown wearing loincloths, and — in Jesus’s case, clearly — nailed to the cross thru their palms. 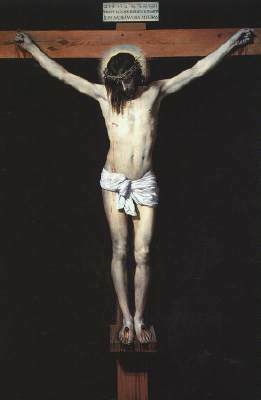 (No nails are shown, but notice the angle of his arms, neither tied to the cross with ropes, nor nailed at the wrists.) Some have argued that the position of all three figures is in the ancient orans position of prayer. There are several striking differences, however. The crosses seem to be tau-shaped, that is, with no riser, and thus Christ’s has no tabella (the identifying sign recorded in the New Testament, often depicted in later centuries as reading INRI). The men’s feet appear to be resting on the ground: since this completely undoes the mechanics of this type of execution, we have to attribute that to artistic license and the limited space available to the sculptor. On the other hand, their feet are bound, not nailed: and indeed, the nails in the feet are not essential to the method of execution. Finally, the panel’s background is most unusual. Each of the crucified men is framed by a sort of tempietto, and the pediment on our right even includes some kind of architectural ornament; at the same time, these structures are reduced to mere frameworks, thru which the walls of Jerusalem can be seen. 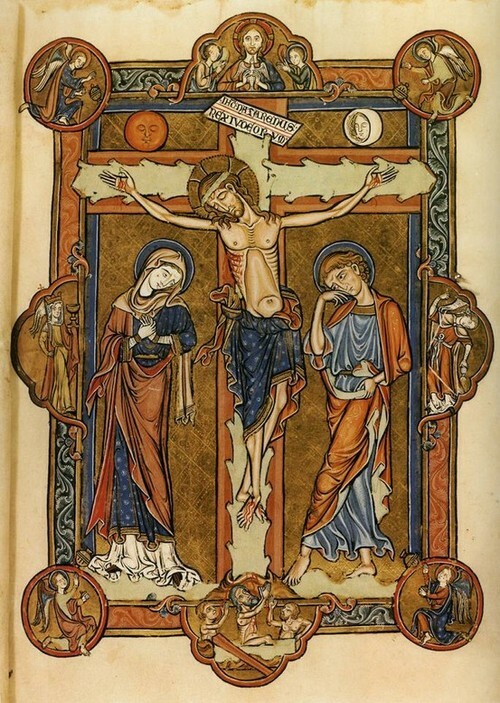 Another invaluable source of how Christians saw their faith are illuminated manuscripts. The scene below is from the Rabulla Gospels which were completed in 586. The author Rabulla was probably the head of the scriptorium in the Monastery of St. John in Zagby, in present day Styria. The text of the Rabulla Gospels is in Syriac. It may be, however, that the author had access to Byzantine manuscripts with New Testament illustrations. This depiction of the Passion is important for a number of reasons. Christ is shown in a colobioum, along sleeveless tunic, as contrasted with the traditional loin cloth. Christ is shown here with a beard, a tradition which became definitive in the East, whereas before he was shown beardless. He is also nailed through the ankle rather than the feet. He is alive on the cross, with no signs of failing. What is most significant is that in the complete image from the Rabulla Gospels is the fact that below the Cross is the empty tomb. 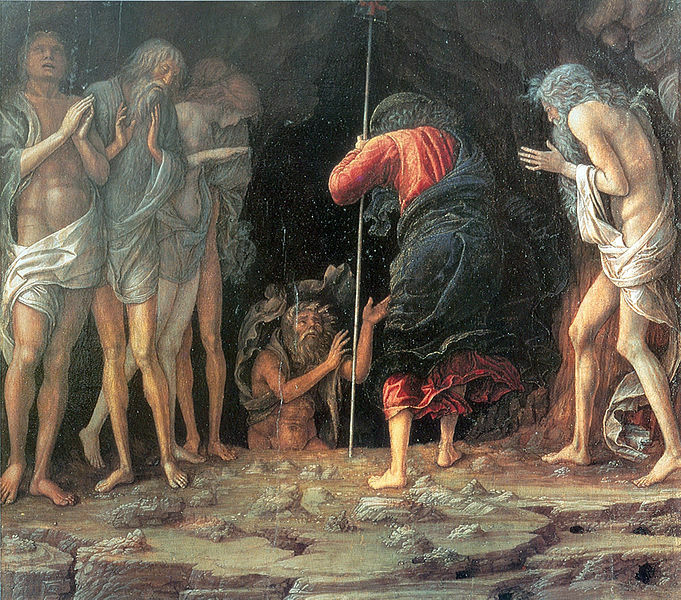 At this stage of Christianity artists were probably reluctant to probe the mystery of Christ’s Resurrection, but there was an interest in what happened during His three days in the tomb. At this stage they did not depict the conquest of Hades in art (which will later be addressed) but they did indicate the effect of an explosion of light on the tomb and on the guards. 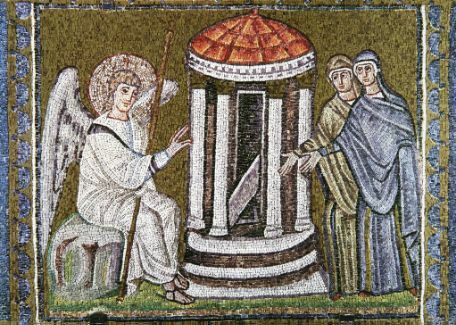 To be noted is the fact that before this date the Resurrection was mainly depicted by showing the women talking to an angel at the empty tomb, or approaching the tomb, as seen in the mosaic image of the empty tom at St. Apolinnare Nuovo in Ravenna. In the Rabulla Gospels the women and the angel have been put to one side, while on the other side the risen Christ is shown greeting them. What Rabulla is demonstrating is is the integral unity of the Cross and Christ risen; a unified vision. Above we see life is destructible but in the scene below His life is shown as indestructible. 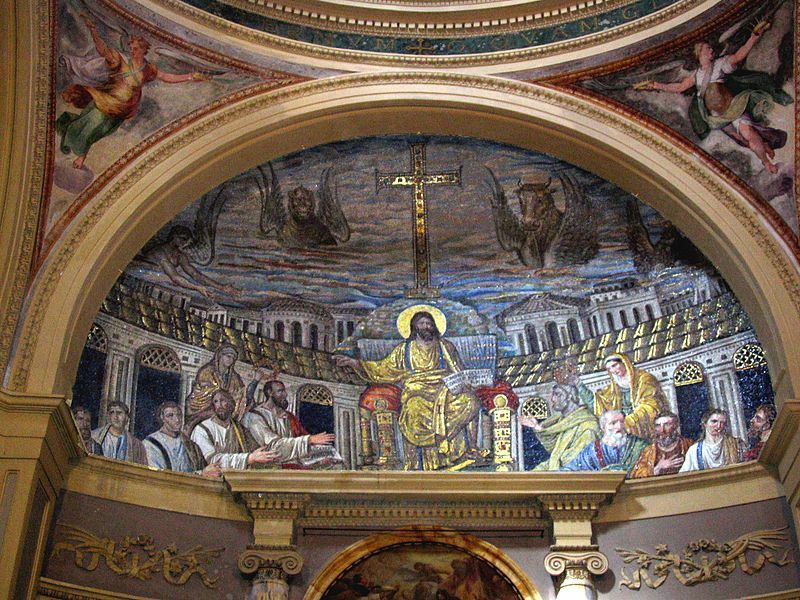 In the Church of Santa Pudenziana in Rome there is in the apse a mosaic from the fourth century depicting the Crux Gemmata (Jeweled Cross) standing on the hill of Golgotha. The figure of the cross recalls the True Cross upon which Christ was crucified at Golgotha, but also the Cross in Majesty that will appear alongside Christ on the Day of Judgment, and the Tree of Life that grew at the centre of Paradise. These threefold meanings often reside in combination in early medieval art. 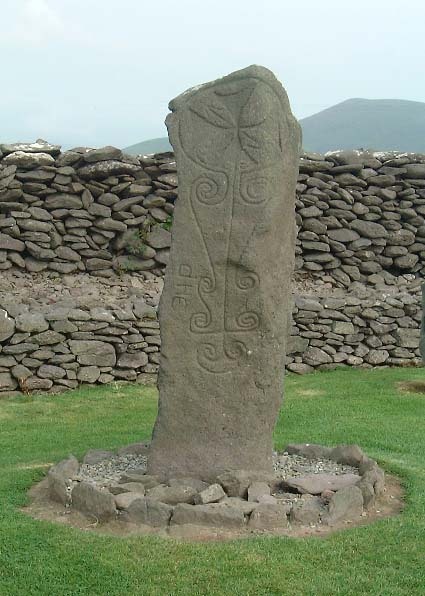 The influence of the Cross was to be most persistent at the edges of the Roman Empires: to the east in Georgia and Armenia, and outside the Empire to the West, in Ireland. In these distant parts, it was not in mosaic, ivory or wood, that this mage of the Cross appeared and survived, but in stone. These Crosses appeared, as mentioned in Ireland, but also in Wales and parts of Scotland from the fifth century, particularly from the seventh to ninth centuries. These crosses show the influence of the pre-Christian standing stones and cary Celtic decorative motifs. 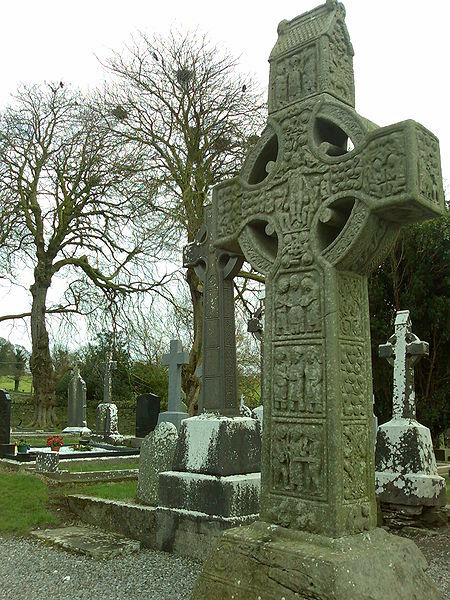 On the Muiredach’s Stone at Monasterboice the most important feature is the continuity with the large Jeweled cross that pilgrims from the fourth century onward saw erected in Jerusalem. The tree itself Borne on the air, light wound about it, -A beam of brightest wood, a beacon clad In overlapping gold, glancing gems Fair at its foot, and five stones, Set in a crux flashed five stones from the Cross tree. Around angels of God All gazed upon it, Since first fashioning fair. It was not a felon’s gallows, For Holy Ghost beheld it there, And men on mould, and the whole making shone for it -Signum of victory! In the earliest depictions of the Passion that have survived, Christ is shown alive on the Cross. This occurred in both the East and the West. The reason for this and the eventual move to show Christ dead on the cross is related to the theological controversies of the time. The Church asserted that Christ was truly human and divine, yet remains one undivided person. 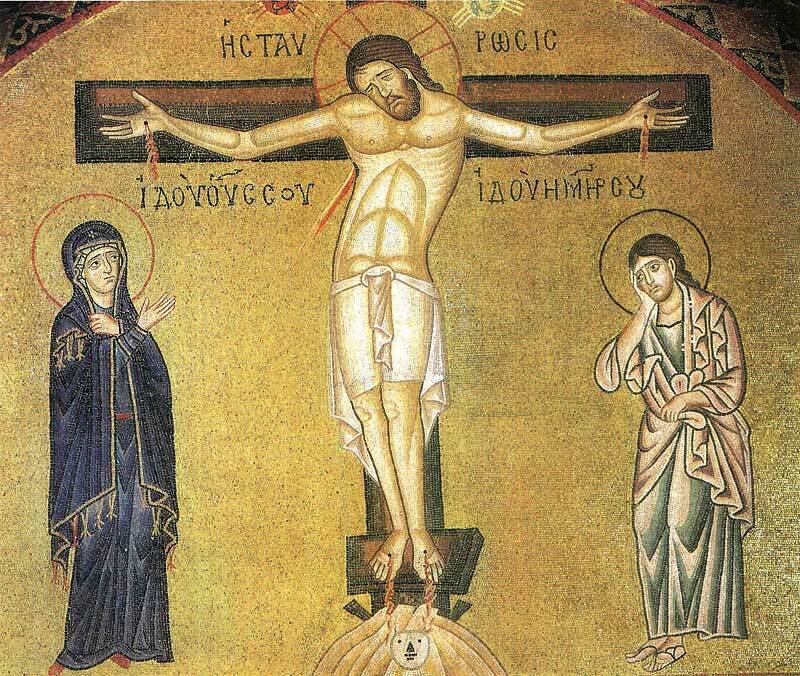 How should Christ be depicted on the Cross? If he was simply shown dead, or in the tomb, people might wonder what happened to His divinity. from the 4th to the 7th centuries artists chose to avoid these controversies by not showing Him dead on the cross. Change came in the 7th century and the first part of the 8th Century when Christ his shown dead on the Cross. At this time the Church had resolved its doctrinal issues, leaving the way to find artistic ways to demonstrate all aspects of the truth. The definitive way the orthodox Church depicts the Resurrection is the scene known in the West, and mentioned above, as the Harrowing of Hell or as the Anastasis, the Greek word for Resurrection. The image below is from a mosaic in the Church at Daphni near Athens dating from the about 1100. It shows all the main details as it had evolved over the previous four centuries. 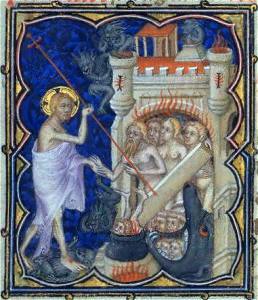 Here Christ stabs Satan/Hades with his great cross and the broken gates and bars of hell are seen. With one hand Christ pulls Adam out of the grave, while next to him Eve pleadingly waits her turn. Next to her are King David and King Solomon. On the other side John the Baptist stands with raised arm indicating Christ. From me you shall not sever. There you shall be without ending. To joy that lasteth ever. In the year 800, Charlemagne, the King of the Franks, was crowned Roman Emperor by the Pope. It marked an attempt to revise and re-establish the Roman Empire in the West. 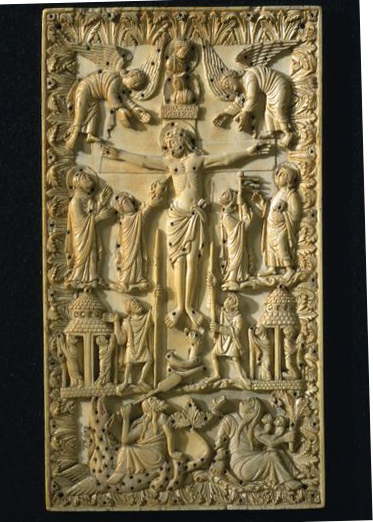 The art of the Carolingian period tolerated scenes of the Passion, as seen in the ivory panel below which depicts the Crucifixion and was meant to be a book cover. 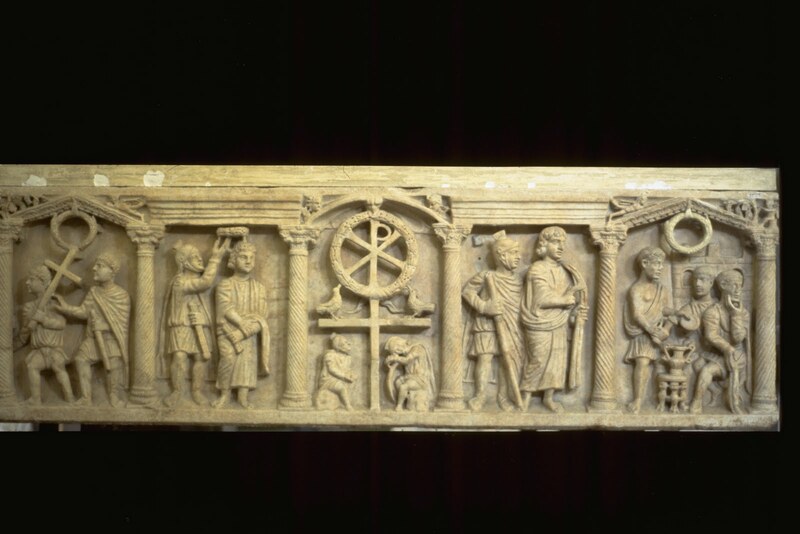 This plaque was made in Metz during the third quarter of the ninth century and is now in the Victoria and Albert Museum. 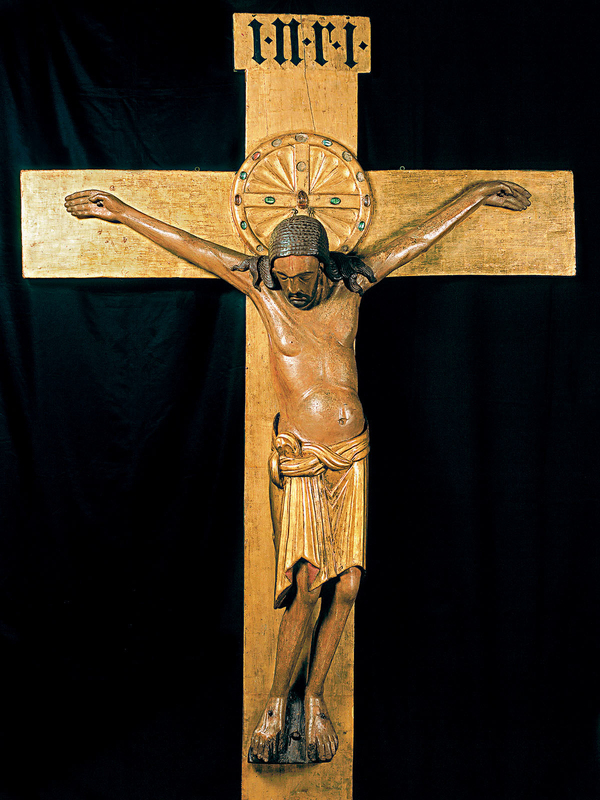 This crucifix is 6’2” in height and is the earliest monumental sculpture of the crucified Christ still in existence. 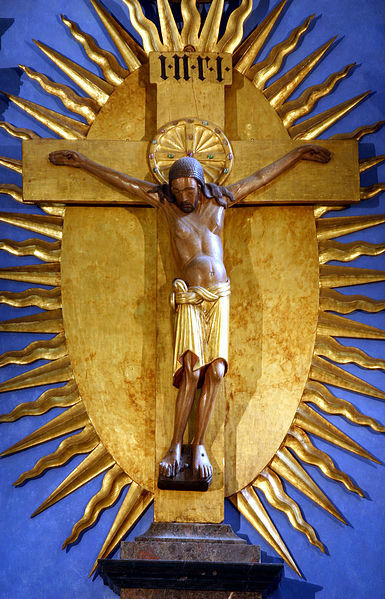 Made of wood and painted, it was commissioned in 970 by Gero, Archbishop of Cologne, Germany, for his cathedral. In the Gero Crucifixion there is no concentration on suffering as such. What is caught and conveyed is the sheer weight of Christ’s body, hanging and yet in repose. This a very human Christ who actually hangs upon the cross, his body sagging from dead weight. The muscles and skin are stretched from the shoulders across the chest. The stomach bulges out from the weight of the torso pressing down from above. The eyes of Christ are closed in death and blood streams down across His forehead. The lips are contorted and the mouth at the corners hangs down. Between the bottom lip and the chin a deep cup indicates that the head fell down onto the chest at the moment of death. This is not a serene image. Here is dignity, serenity and restraint, conveyed in the fine, graceful lines. This is the kind of restraint that at once hides and conveys powerful emotion. As Richard Harries comments in his work The Passion in Art: “..it is poignant without any suggestion of emotional bludgeoning. 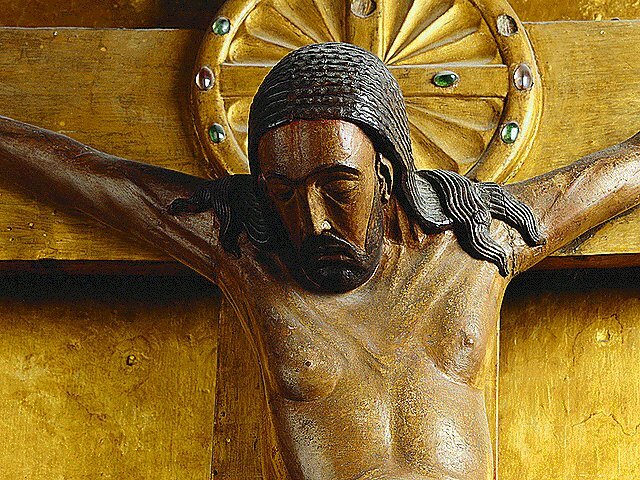 The suffering is accepted rather than abject.” The Gero Crucifix is the oldest surviving example of a free standing Christian sculpture in the West, and it is remarkable for that alone. From the eleventh to the early thirteen century the Romanesque style flourished. While known for its architecture this period also saw a great birth of monumental sculpture. This for the most part consisted of relief sculpture in stone, subordinate to the architecture, and placed in an overall framework provided by the building. Some fine free-standing carvings in wood and metal were also created during this period. 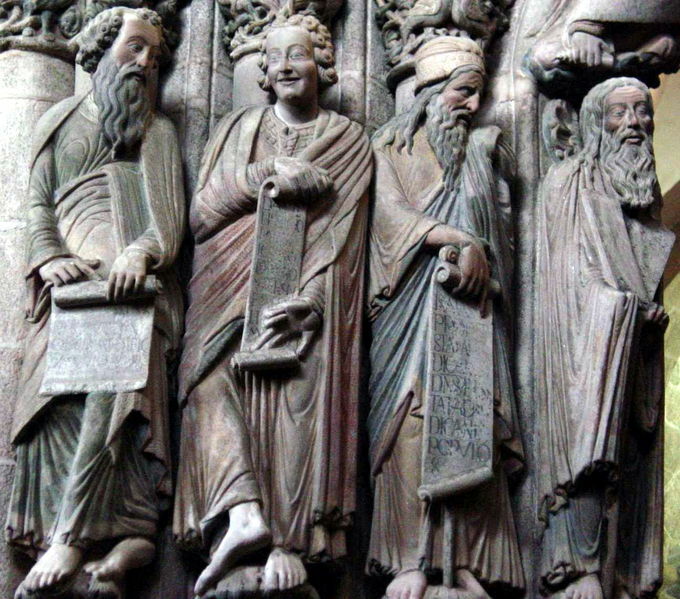 Romanesque sculpture has a somewhat semi-abstract style. The artists were not so much interested in a natural style. There is very often a linear or abstract element in the work which can convey calmness, severity or excitement. 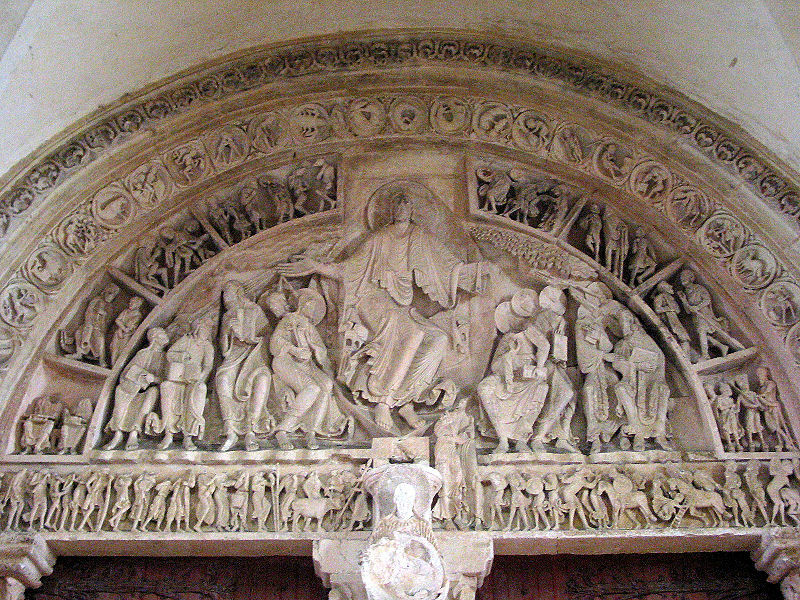 The tympanum seen over the main door of Romanesque cathedrals seems to capture all three qualities just mentioned. 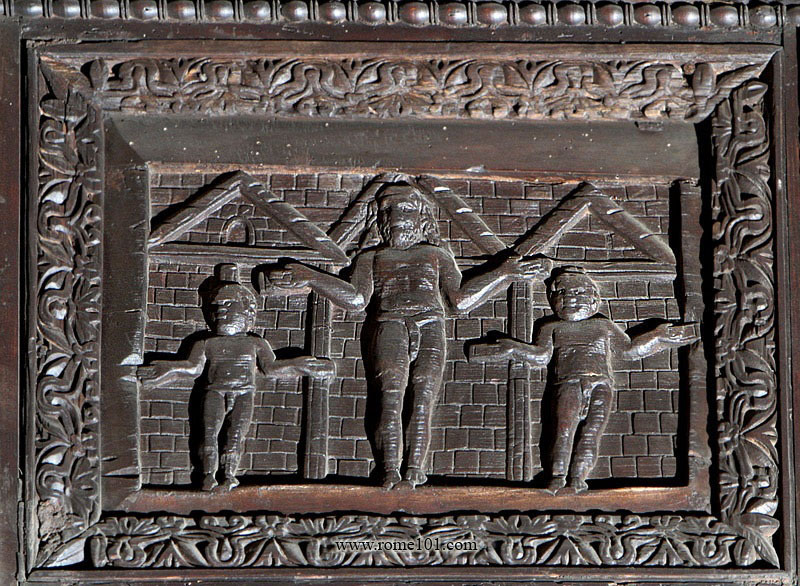 Nevertheless, some fine free-standing carving in metal and wood was also produced. The most striking form of crucifixion in this period is one which shows Christ in triumph, reigning from a tree. he is depicted in a long-sleeved robe, with a distinctive belt rather than a loin-cloth and half naked. The most famous image of the Romanesque period, the so-called ‘Volto Santo’, Holy Face, in the Cathedral of St. Martin at Lucca. According to medieval legend, Nicodemus did all the carving work but the face, which he hesitated to complete for fear of not doing it justice. He fell asleep, and upon awaking found the face beautifully carved – the miraculous work of an angel. The Crucifix of the Holy Face was buried in a cave for safekeeping, where it remained for centuries. It was rediscovered by Bishop Gualfredo, who was on a pilgrimage to the Holy Land when its location was revealed to him in a dream. To allow God to decide where the Crucifix should be kept, the bishop set it adrift on an unmanned boat in the Mediterranean Sea. The Volto Santo arrived on the shores of northern Italy, where the Bishop of Lucca, also prompted by a dream, put it into a wagon with no driver to determine its final location. The two oxen pulling the wagon stopped of their own accord at Lucca in 782. The Volto Santo was placed in the Church of San Frediano, but the next morning, it was found to have been miraculously transferred to San Martino. For this reason, the legend explains, San Martino was designated the cathedral of Lucca (an honor previously held by Santi Giovanni e Reparata). 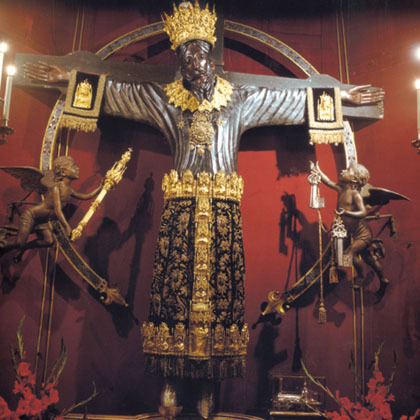 There are two feast days for Il Volto Santo, May 3 and September 14. On those days, he is dressed in the magnificent crown, collar and belt and viewed in the Cathedral. In addition, in September there is the traditional procession known as the Luminaria where he moves through the streets of Lucca from San Frediano back to San Martino. 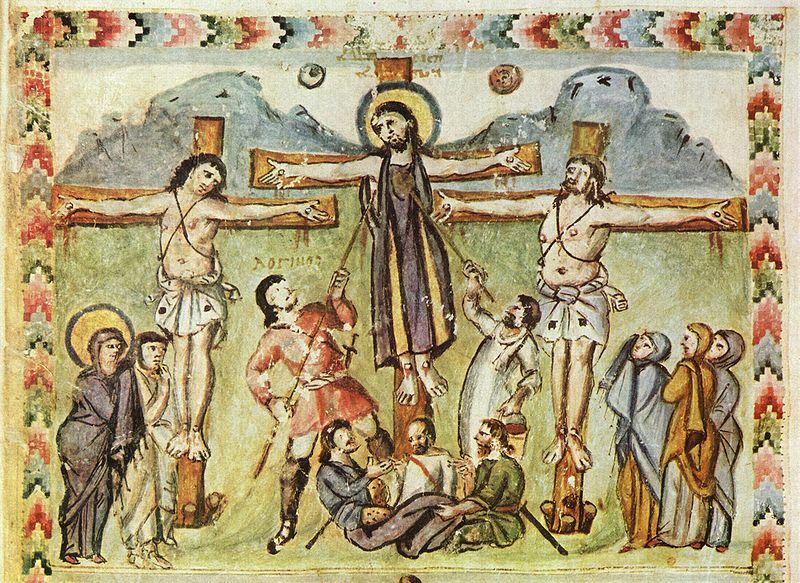 The tenth century saw an emphasis on the suffering of Christ on the Cross. This was reinforced by the work of some of the great theologians in the eleventh and twelfth centuries. Anselm, Archbishop of Canterbury dealt with the intensity of Christ’s suffering. Why, O my soul, were you not there to be pierced by a sword of bitter sorrow —when you could not bear the piercing of the side of your Saviour with a lance? Why could you not bear to see the nails violate the hands and feet of your Creator Why did you not see with horror the blood that poured out of the side of your Redeemer ? Why were you not drunk with bitter tears when they gave him bitter gall to drink? Why did you not share the sufferings of the most pure virgin, his worthy mother and your gentle lady what can I say about the fountains that flowed from your most pure eyes when you saw your only Son before you, bound, beaten and hurt? What do I know of the flood that drenched your matchless face, when you beheld your Son, your Lord, and your God, stretched on the cross without guilt, when the flesh of your flesh was cruelly butchered by wicked men? How can I judge what sobs troubled your most pure breast when you heard, ‘Woman, behold your son’ and the disciple, ‘Behold, your mother,’ when you received as a son the disciple in place of the master, the servant for the lord? This emphasis on the suffering of Christ increased through the Gothic period. The Cologne crosses in the slideshow are the product of the experience and expression of the Black Death which was ravaging Europe where as much as 50% of the people died. To express Christ’s solidarity with the people, these crosses began to spring up in churches throughout Europe. 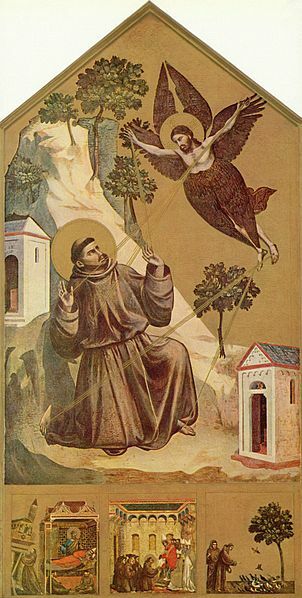 Another person who emphasized the suffering of Christ was St. Francis of Assisi. He did so before he experienced the stigmata in 1224; an event which gave further emphasis and impetus to the wounds of Christ. 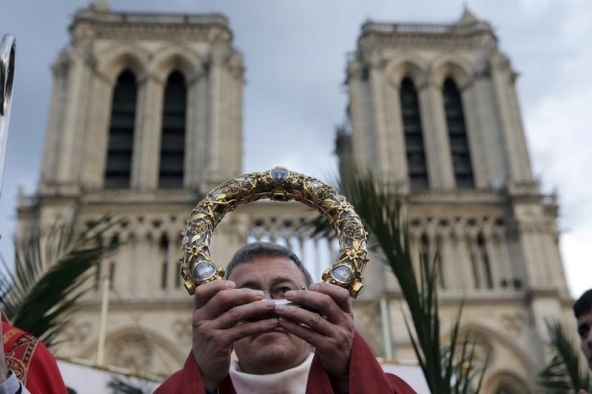 An interesting historical event took place in 1239 when king Louis IX of France received what was claimed to be the Crown of Thorns from Constantinople. In fact depictions of this crown indicate that it was a wreath of rushes. (Please refer to the Amesbury Psalter image above.) 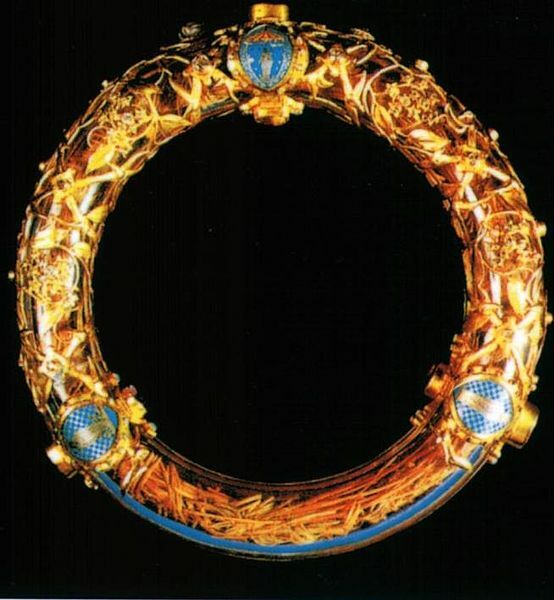 In the early 14th century the Crown of Thorns, as we know it, came to be depicted. The origin of the idea lies in the biblical writing that Jesus was descended from Jesse. the father of King David. The text of Isaiah 11:1: ‘A shoot shall grow up from the stem of Jesse’ received pictorial form in the ‘Tree of Jesse’. Sometimes at the apex of this tree a lily and hanging on the lily is Christ crucified. The relevant fact here is that March 25 , the Feast of the Annunciation, was thought by people in medieval times also to be the day on which Christ was crucified. Since Mary is symbolized in the lily and she conceived Christ on March 25, so also on that day he is crucified, giving birth to our redemption. The image of The Man of Sorrows has often been described as the most precise visual expression of late medieval piety. Richard Harries explains that The Man of Sorrows brings image and viewer together with a religious intensity that has rarely been surpassed. Simpler forms of The Man of Sorrows displayed only Christ’s head and shoulders, with the eyes shut and the head inclined. These works were from the Byzantine period and usually used for private devotion, usually as part of a triptych. The image of Christ in the center with Mary and John on either side. The more usual form of The Man of Sorrow was like van Meckenem’s. 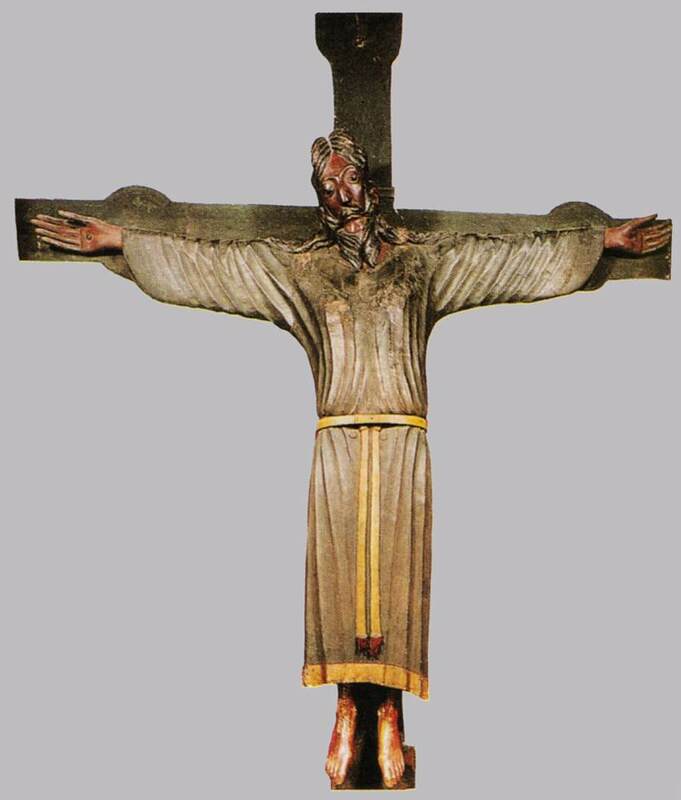 Here is a half length figure of Christ’s suffering in front of the cross with arms folded over his breast. A mosaic icon of this type was taken to the Church of Santa Croce in Gerusalemme Rome from Constantinople in 1300. 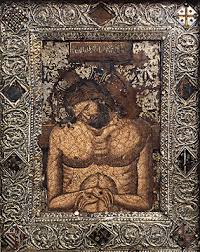 In the West, this particular image of The Man of Sorrows gained more prestiege when it became associated that the image of the suffering Christ had come in a vision to the great Pope Gregory (540-604) while he was saying Mass. 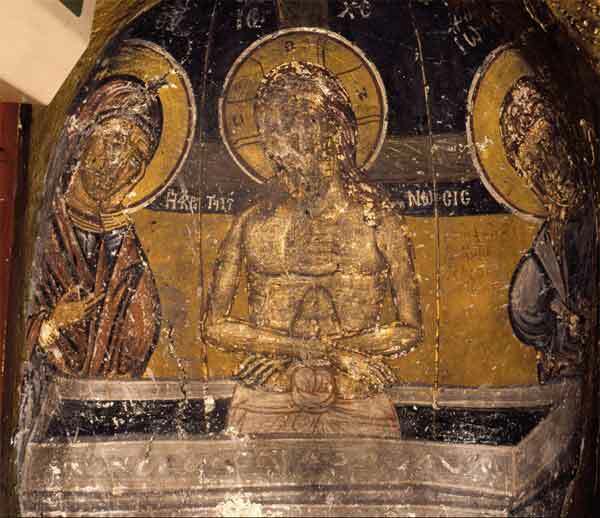 As mentioned earlier, Christian art was a reluctant to depict the actual mystery of Christ rising from the grave. The portrayal of the Resurrection saw either the women at the empty tomb of as seen in the slide show below, or in the Anastasis already mentioned. There was a reluctance to give expression to the bodily expression of Jesus Resurrection in Italy. The exception is the fresco by Piero della Francesco (1410) found in the town hall in Sansepolcro. Some critics of the painiting find it too literalistic. Here Christ faces us in majesty, with the traditional banner of the resurrection indicating His triumph over death. Below the soldiers sleep, with one possibly a self portrait of the artist. In sleep, it could be they are dreaming the scene. The wounds remain of Christ’s body, but the flesh is beautiful and the body is classical. This painting touched the agnostic Aldous Huxley who in his essay entitled “The Best Picture” made the claim that a this fresco painting by was “the greatest picture in the world.” For your meditation I have presented “the best picture” in a large format. The art historian Jane Dilenburger called the Isenheim Altarpiece, ‘A work of such tremendous and dismal grandeur of expression that nothing on earth seems to equal it.’ The theologian Paul Tillich said it was the greatest German picture ever painted. An even more important factor for understanding the painting is the fact that it was painted for the Order of Saint Anthony, who tended the sick, especially those afflicted with St. Anthony’s fire or ergosim, a disease which caused horrific lesions and eruptions of the skin. Tradition claims that each new patient was brought before the altarpiece in the hope of a miracle. If the miracle did not occur in the painting Christ shared not only their suffering, but their disease. Here Christ was with them in their agony and in receiving the Eucharist Christ would sustain them. Grunewald expresses the reality that Christ, like us, experiences the violence of life but it is not without hope because seen in the bottom of the painting the dead Christ prepares for his entombment and rests in the hope of the Resurrection. The portray of Jesus alone on the Cross became popular in the 17th century. before this period, it was popular to include individual, and at time, large anonymous crowds. In the 17th century a number of artist followed the theme of the solitary Christ. Pope Francis, is a devoted fan of Chagall, and his favorite is the artist’s “White Crucifixion,” a 1938 painting on display at the Art Institute of Chicago. Chagall painted “White Crucifixion” in France, in response to Kristallnacht. Christ crucified is in the center, but Chagall himself said later, it is by no means a ‘Christian’ picture. The scenes that surround the Cross – a shattered village, a pillaged burning synagogue – tell its real meaning. It is a Christ who symbolizes the Jews who suffered at the hands of the Nazis. If we look more closely at this mirage of scenes, we see on the upper left there is a horrified woman and three rabbis fleeing; a little below them to the left soldiers carrying red banners press forward killing villagers and destroying their houses and obliging others to flee across the water in a boat. On the top right there is a being burned by a Nazi brownshirt with Nazi flags flying above the flames. The synagogue’s furniture and books are thrown out into the street. 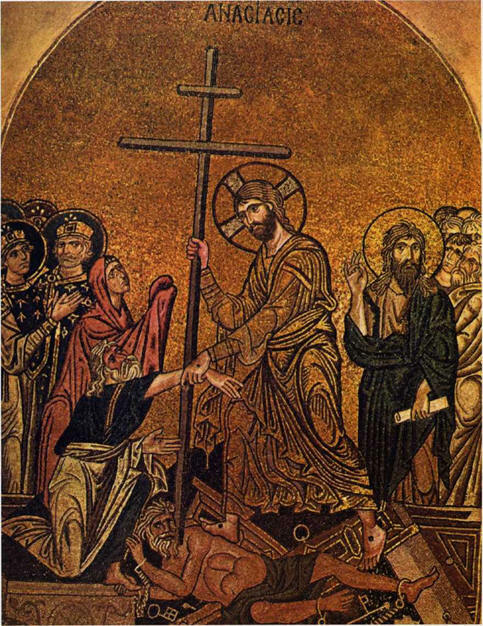 Below, on both sides of the Cross, we see people running from those persecutions to hide and save the Jewish religious books and symbols from desecration. Among these fleeing people, there is one in blue at left who wears a placard, which said ‘Ich bin Jude’ (‘I am a Jew’). At right below the Cross a white light comes from a scroll of the Torah and moves up a ladder to the Cross. The light is traversed by a green clad figure carrying a bundle. This figure appears in a number of Chagall’s painting and has been interpreted as the wanderer Jewish of Yiddish tradition. 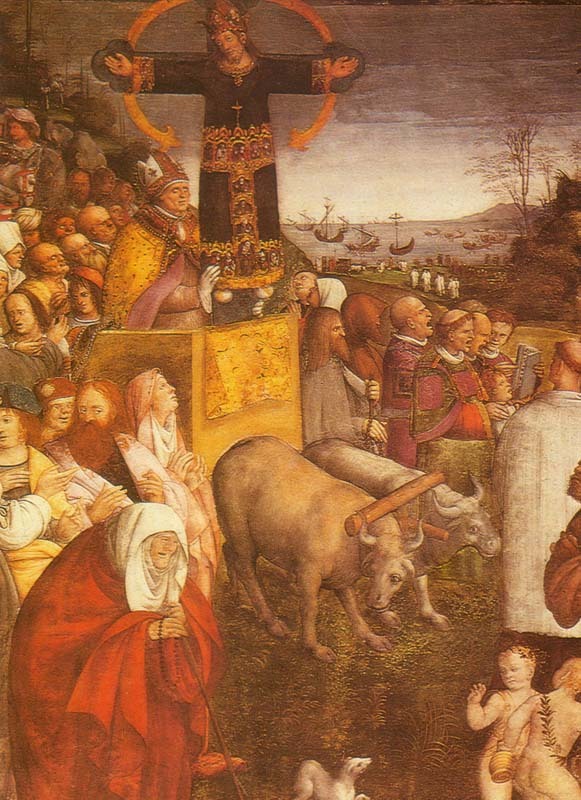 Dominating the picture in the center is the figure of Christ crucified. But this is very much a Jewish Christ who wears a Jewish tallith instead of a loincloth. His head is covered by a bandana. Over his head written in Hebrew and Latin are the words ‘King of the Jews.’ Below, at his feet burns a menorah – strangely, with only six candles, one unlit – which is surrounded by a halo like the one that frames his head. On Christ’s right is a ladder propped against the Cross. The ladder has been interpreted as Jacob’s ladder reaching to heaven. I am a Catholic Priest of the Diocese of Richmond. I am also a presenter in the Theology and Symbolism in Art from the art of the catacombs to modern art. My current research is on the duplicity of art in 19th Century America. This entry was posted in Crucifixions, Early Art, Faith, Symbolism, Uncategorized. Bookmark the permalink. My name is Monsignor Mark Richard Lane, a Roman Catholic Priest of the Diocese of Richmond, Virginia. I have been teaching courses in Theology and Art for over thirty years. The Church has, from its foundations, used the language of the symbol to draw us to a deeper level of understanding the faith. Symbolism,for the person of faith, is a largely forgotten language. Secular art, as well, speaks symbolically. I am also a photographer and through my page "To See The World.." I wish to present through photography the beauty God and God's creation in another media.